Open-front jacket has hand-print on one side and reverses to overdyed patchwork. Hand embroidery and patch pockets on both sides. 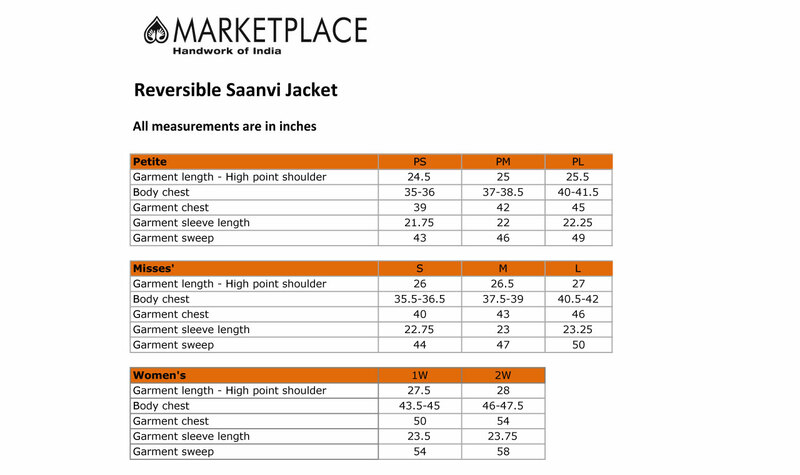 • Length: PM 25" M 26.5"
Wonderful jacket that is reversable and lovely on both sides. I like it because the patterns on the fabric aren't too big and loud. love this item and it's reversible. both sides are attractive, which often is not the case with reversible items. I love this jacket. The fabrics are lovely and the craftsmanship is excellent. The sizing is very accurate. I have already worn it and received compliments. I know I will wear it often because it is so versatile.